This 6 x 4 curved roof shed benefits primarily from the roof itself. This roof allows rainwater to simply slide off and hit the ground below. It’s a great feature, and it ensures that you have a shed that is kept dry throughout the year. 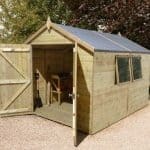 For some of the best 6×4 sheds currently on sale in the UK right now why not check out the 6×4 shed award winners. There are other features as well that make it a true bargain. For example, there is a ten-year guarantee against rot that makes it a truly long life building. We particularly like the alternative roof of this great quality shed. It provides a unique design which still prevents rainwater collecting just like the more traditional apex roofs. 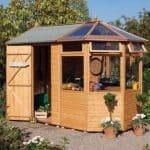 It is one of the smallest models available which means it should fit comfortably into any garden. 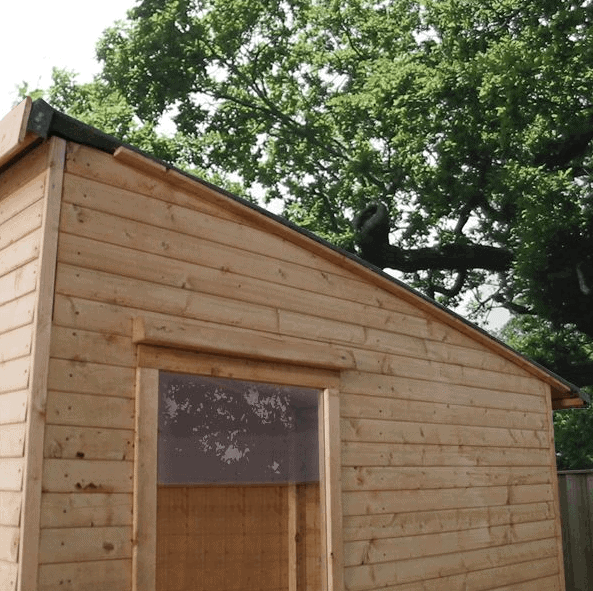 It is one of the more affordable sheds in the Woodland Trust collection, yet it comes with plenty of great value features. You can tell a lot about the quality of a manufacturer by looking at the features they include with the products they create. 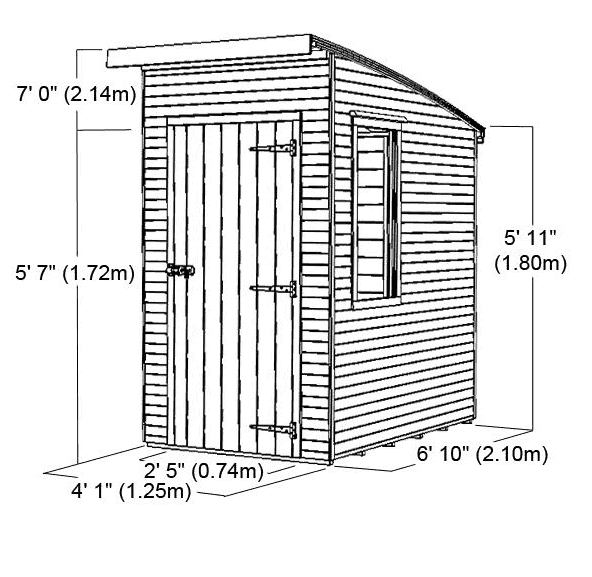 This shed comes with some pretty impressive benefits considering its affordable price tag. 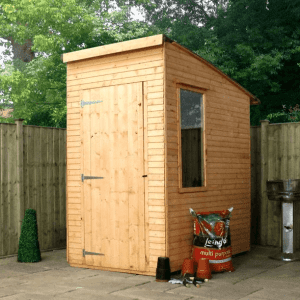 Two large styrene glazed windows – The majority of small sheds feature just one window, but this excellent model comes with two large windows for maximum light. Both are styrene glazed, offering great shatterproof benefits. Tongue and groove roof and floor – Both the roof and the floor have been designed with strong overlapping tongue and groove construction. The floor features 16mm tongue and groove, while the roof features 12mm tongue and groove. 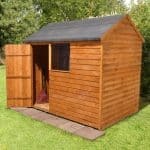 Heavy duty felt – The shed comes with high quality, heavy duty roof felt included. 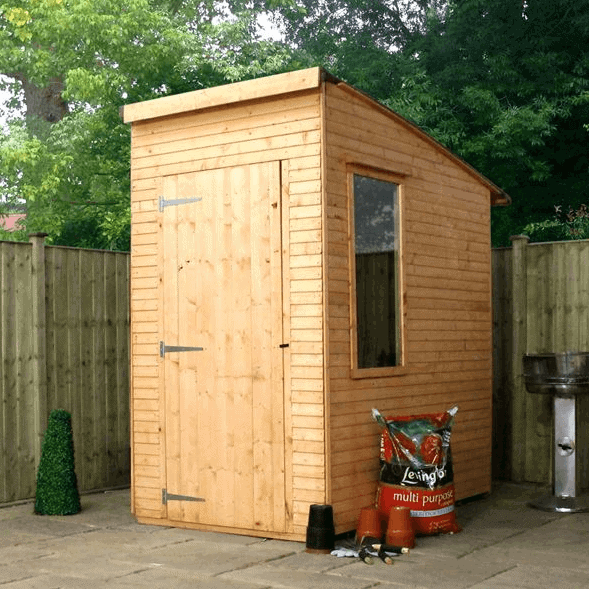 16mm Shiplap Plus Cladding – Like others in the range, this shed comes with 16mm Shiplap Plus Cladding to provide an incredibly tough, weatherproof finish. 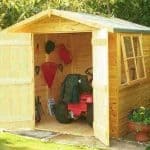 2×2 Framing – High quality 2×2 framing adds to the durability of the shed, giving it an extremely strong, long lasting design. Butterfly catch – The butterfly catch ensures that the shed door closes properly and more importantly, that it stays closed. 10 year anti-rot guarantee – Giving you total peace of mind, your shed is guaranteed against rot for 10 years. UK built and Woodland Trust approved – The shed boasts the best in British manufacturing and comes fully Woodland Trust approved. 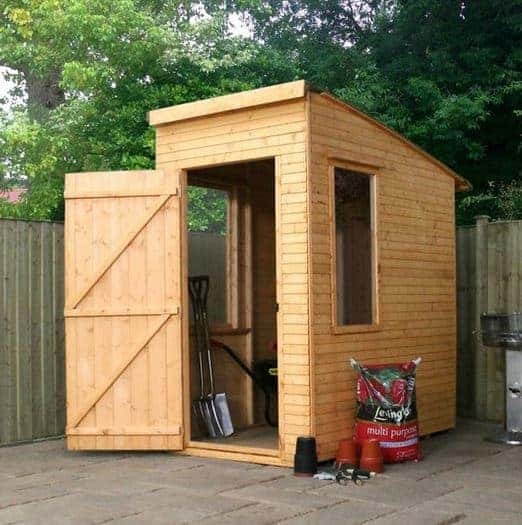 This shed has clearly been built with safety in mind. The styrene glazed windows, tongue and groove and Shiplap Plus cladding all help to give the shed a tough, safe design. The only thing that you may find a little disappointing is the fact it does not come with a lock. If your garden is secure, this won’t present a major problem. However, it may be worth investing in a lock to ensure complete privacy. 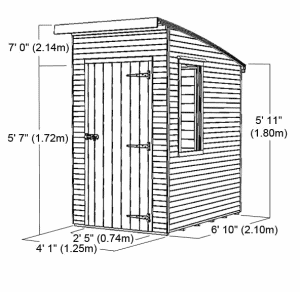 Due to its small size, this shed is really easy to put up. It can be assembled with one person, though two people will speed up the process. The instructions are simple and the boards fit easily together. It will still take a few hours to construct but everything you need is included and you shouldn’t find it difficult. There are quite a few things we like about this shed. Firstly the curved roof adds a great visual appeal. 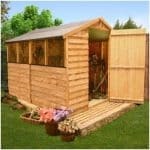 Not only does it look good, but it also plays an important role in helping your shed to stay dry throughout the year. There is also quite a lot of interior space despite its small size. The construction of the shed is excellent with the 16mm Shiplap Plus cladding being one of the highlights. The fact it doesn’t come with a lock may be a concern if you’re hoping to keep children or potential thieves out. As the shed has windows, it doesn’t offer much in the way of privacy. So if you aren’t planning on buying a lock, you should avoid storing anything of value. The shed also has an unpainted design. While this can provide a more rustic, natural ambience to the garden, it may not be to everyone’s taste. Keep in mind that you can always paint the shed yourself at a later date. 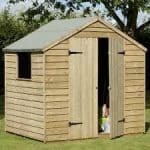 If you are looking for a small, high quality shed which provides excellent value for money then we really recommend this model. It has a lot of great features included and has been designed with quality and durability in mind.